I really appreciate that Charlene knows how to exit a vehicle and find her pink dress simply lovely. But, something just occurred to me when I was looking at Charlene's blue suit earlier and now the pink flowy number vs Wasty. There's always this hubub about all of WK's outfits selling out in seconds after she's photographed. That may be true, but, I appreciate the fact that, for me, Charlene's clothing is her style and hers alone and fitting for a princess. It should be slightly out of reach for the mainstream to enable the regal-ness to be in place. The timeless style of both the suit and the dress can be seen elsewhere, but when she's wearing it, it becomes hers and hers alone. Gosh, I hope this makes sense because it was a real eye-opener for me. In essence, Kate Middleton wear is Average Jane Wear and degrades her role. Make sense? The same holds true for a majority of the pictures at this dinner. They reflect the style and tailoring for each woman. Doesn't anyone feel that this is all quite strange? It's one of most important moments in the celebrations but Charles is not in any of the events in Windsor with his mother but he makes a dinner in Buck palace for the royal guests. Like if there were two courts without relation between them. Marjorie Orr talked about this a while ago, that PC wasn't present. It's somewhere in the predictions thread. BP and SJP/CH have always been two very seperate courts. 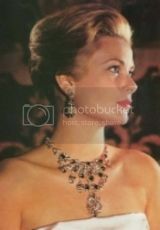 And the fact that HM is celebrating her Diamond Jubilee means PC is still waiting... I don't know why he wasn't there, but it doesn't really surprise me as the Windsors have never appeared to me like a family. Yes, I remember but at the time I disagreed with Marjorie because Charles was supposed to travel to two countries and make a special doc for her. But the doc hasn't appeared and he hasn't attended these. Although he went with his parents to an event in London but it didn't get the press that these are getting. I'm also kind of surprised that he didn't use the event to show Camilla. Yes, but those are just normal work commitments that happen to be for the jubilee. I don't think he's emotionaly involved in this. The dinner is the same. He can give a party and say it's for HM, but there's no real connection. It's as if he's distancing himself from HM. I wonder if Charles is angry at his motehr; usually he is dutiful and until recently almost affectionate, but go figure now he seems as if he can hardly bother with her. No real emotional attachment to such a milestone. Maybe it is the fact that he has such a large ego and he is not the one getting all the attention. 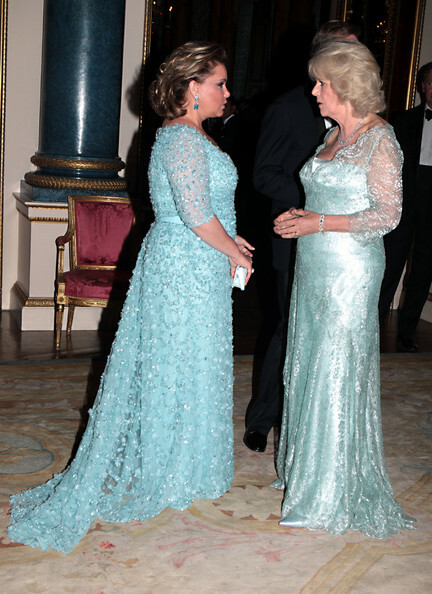 I disliked Camilla's dress, nice periwinkle colour but the fabric is too shiny and the sleeves make it look a bit like a nightdress! ^Come to think of it, it does look like a peignoir. She's never been accused of being a fashionista anyway. ^That's got to be it because doesn't everybody Kopy-Kate?! It's a law or something now in the UK, I'm sure. From the posts I have read on another forum Kate is giving fashion advice to everyone in the royal family including the Queen. That is why they all chose blue when they went to the tea room. Kate advised the Queen that they should coordinate colors. Oh I remember that dress on Duch Cam before somewhere. I do love the color and the shape of it but I agree with all of the posters who said it looks a touch like a fancy nightdress from a distance. I like her hair in these-a bit brighter than usual it seems but might just be the lighting. And Andrew, too. Has he been included in any of these events? PA as well. I haven't seen all the pics, so I don't know. Is there a family divide going on? Leave it to WK to cause a rift, if so. And things were going so much better 'til she showed up, too! Drives me to distraction. It seems to me as if Charles and his family are calling the shots and the other children of the Queen are being sidelined in this her special year. She may still be with us but the changing of the guard is happening subtley but changing it is - to Charles and his sons - while the others are being sidelined. The fact that the York girls have been told to get jobs shows this as well as it means that Charles, William and Harry will be the sole focus of the royal family in the future. Don't get me wrong I am not suggesting that Charles and his sons are staging a coup but rather that the Queen is stepping back slightly and letting them call the shots more to ensure a smooth transition when the time comes. It is part of the training of her heirs - both Charles and William - so that their ideas are coming more to the fore. I don't think Charles and The Queen have ever been that close. He supports his mother as his Queen certainly but I don't think they ever really socialise or have those lovely times as mother and child that most of the rest of us have had.